Hunter Valley ~ Life after Thirty.. I don't know if you know this, but me and Zee are coming up to nearly 5 months in Sydney. Do you know how many times we have actually left the city limits? Don't think thats a bad thing. The whole point of staying in Sydney is to get to know the city. Its amazing, and we could definitely live here. That was the whole point of coming here. Plus, we had to save money for our trip up the East coast, Fiji and the USA which is coming up soon. Anyway with Zenas Birthday last Wednesday and Valentines day the following Tuesday, we decided to spend the weekend in between by going up to the Hunter Valley. 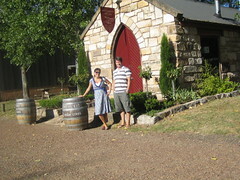 This is a wine making region, two hours north of Sydney famous for its Semillon and Shiraz wines. There are lots of different regions of Vineyards in Australia, with the Berossa and Clare Valley's some other famous places. The Hunter Valley is pretty amazing. We booked ourselves into a great little cottage, on the Stonehurst Vineyard which is between Wolombi and Cessnock. The Lower Hunter Vineyards are about 30kms away, and as we didn't want to drive our hire SmartCar past our limited K's, so we got a Wine Rover to use. $25 each, and it was like a personal taxi around 10 different vineyards!! We started off by trying to find a white wine we both liked, and eventually settled on not too dry and not too sweet, a Sauvignon Blanc! Then instead of doing what (apparently) a lot of Tasters do, and try ALL the wines in every vineyard and then collapse drunk on the floor, we decided to limit it to Red Wines. Especially what we can get back in the UK. We eventually found our favourite wine, a Chambourcin from the Stonehurst Vineyard. We had a great time there, and would definitely recommend it. long time no speak but have been looking see how trips going. have to say m8 looks like u living well or was it a wide angle camera?? tin now left for raf, god imagine having to call her maam!! well u gonna get a real job after this trip? chris my second son! is off to aus in june for 12 months sorted accomadation and part time work in perth so have told sue durban is closer to perth than worcester so she is concidering more now. dont rush back m8 the southern hemisphere will allways be best just you went to far south couldnt stand all those roo's and spiders lions are much safer. enjoy the rest nothing changes here.